YSL Residences is a new mixed-use of office, retail and residential development currently in pre-construction at 363-391 Yonge Street and 3 Gerrard Street East in Toronto, Ontario by Cresford Development Corporation. 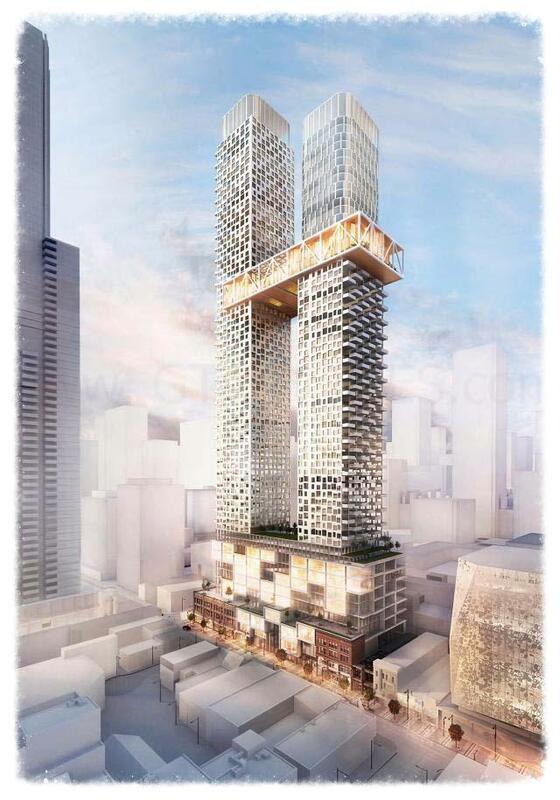 It is a proposed two towers of 62 and 73 storeys with 1,106 dwelling units connected by a sky-bridge designed by Quadrangle Architects Inc. 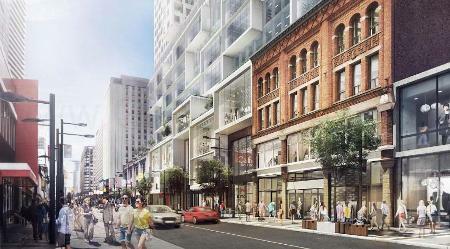 The YSL project consists of the "redevelopment of several storefronts" which spans about half a block on the east side of Yonge Street just south of Gerrard Street East. 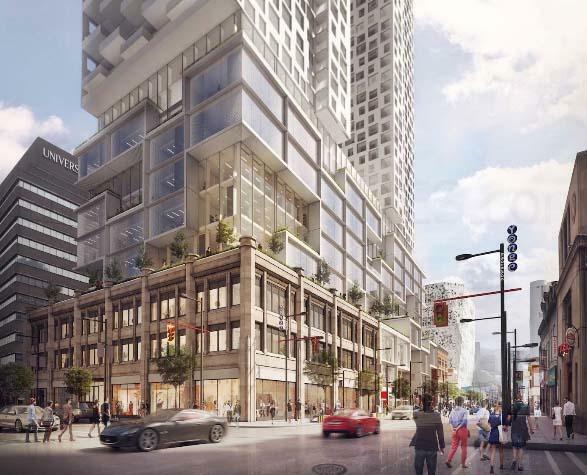 Eight properties in total will be redeveloped while saving the facades of "two heritage-listed commercial buildings" located at 363 and 385 Yonge Street and incorporating them into the 11 storey podium. The podium would stepback at the 4th, 9th and 10th levels. There will be approximately 100,000 square feet of retail space within the first three floors and 186,000 square feet of office use space from the fourth floor to the ninth floor proposed. There are also 1,106 residential units proposed starting on the 10th and 11th floors of the podium that will consist of 26 two-storey townhomes with terraces situated above the podium floors and in the two residential towers of 62 and 73 storeys in height. Of the 1,106 units, 107 are bachelor units, 648 are 1-bedroom units, 241 are 2-bedroom units and 110 are 3-bedroom units. 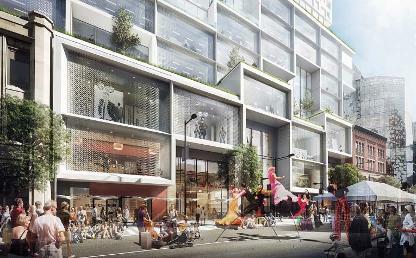 The total gross floor area is 109,235 square metres with 26,760 square metres of total office and retail space proposed. YSL Condos consists of the south building which is 62 storeys in height and the north building which is 73 storeys (843 feet) in height and are connected at the 51st and 52nd storeys. This is where the proposed two-storey amenity sky-bridge to link the two buildings at 580 feet is located that gives "access to the rooftop amenity on the taller of the two towers to create a vibrant and active zone on the skyline". Projecting balconies are proposed on the north side of the 73 storey north tower and on the south side of the 62 storey south tower. There is 2,212 square metres of indoor amenity space and 910 square metres of outdoor amenity space proposed located on floors 10, 51, 52 and 73. There are also 6 levels of proposed below grade space for 289 parking spots of which 221 are for the residents of the building, 23 for visitors and 45 for non-residential. There are also 1,231 bicycle spaces proposed of which 996 are for residents, 111 are for visitors and 124 are for non-residential. Parking and loading is proposed to be accessed from O'Keefe Lane along the east side of the property. The primary entrance for the north tower would be from Gerrard Street East and the primary entrance for the south tower would be from Yonge Street. YSL Residences by Cresford Development Corporation is located close to the Allen Gardens, The Hospital for Sick Children, Ryerson University, the Ed Mirwish Theatre, the Toronto Eaton Centre and much much more. Register with us today for more information on the YSL Residences by Cresford Development Corporation!